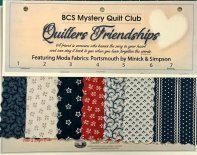 This is an 8 month Mystery Quilt class. Purchase your fabric at the beginning of the class and get instructions each month. You can choose to use this color way, or choose your own fabrics. There are 2 sizes to choose from, Sweet Single 70 X 98 or Quaintly Queen 101 X 104. There is a $35 registration fee which includes the cost of the pattern. Classes are the 4th Monday of each month, starting on January 28th at 6 pm. 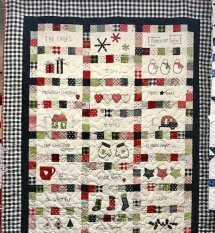 This is a 6 month Block of the Month program that combines embroidery, appliqué, and piecing. We will do 2 blocks each month. Classes are the second Friday of each month, starting February 8th at 2pm. You can come and sew, or just pick up your blocks. Cost will be $18 per month. Mineral Matrix This is a 10 Month Block of the Month. 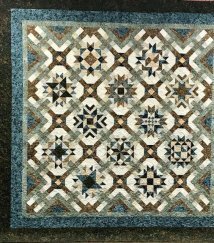 You can choose from 2 color ways, Quarry Batik from Timeless Treasures or Porcelain from Moda. The finished quilt is 104 x 104. Classes will be the second Monday of each month, starting on February 11th at 6pm. Cost will be $25 per month - includes 15 yard of material and pattern.